One of my new year’s resolutions is to drink more water. With all of the well-researched health benefits of proper water consumption, why is it so hard to keep this resolution? Well, water can be boring! Sometimes I crave something with a little flare or better yet, bubbles. Sparkling waters are toted as being much healthier for you than soda, but is it true? 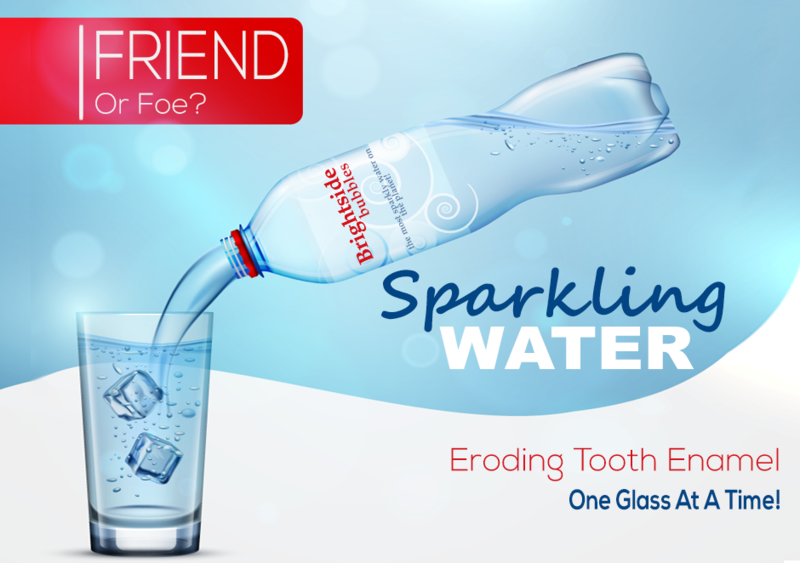 When it comes to oral health, sparkling waters can have similar damaging effects of soda. Enamel, the hardest structure in your body, is the white part of your tooth you see when you smile. Enamel will begin to suffer from erosion at pHs around 5.5 and lower. The lower number a pH is, the more acidic the solution is. In the case of most sodas, the pH ranges from 2 – 3.5. One of the sodas which takes the most heat for harming teeth is Mountain Dew. Its’ pH is 3.3. This is the perfect storm for causing tooth erosion and decay. The acidic nature of the drink, demineralizes the enamel, making it more prone to decay and loss of tooth structure. The bad news is sparkling waters sparkle due to the carbonation. Carbonated water is created by adding carbonic acid to the water. Carbonic acid has a pH of 3 to 4. One of the most popular carbonated waters is La Croix. Their website won’t provide you the exact pHs of their products and acknowledge that depending on what flavor, the pH can vary. While sparkling water may not have the sugar or many of the artificial ingredients, calling them a healthy choice is a stretch. Now that sparkling waters are out as a healthy option, the next way many people try to add more water to their daily routine is grabbing a bottled water. There are no artificial ingredients. No mention of carbonic acid. It is easy to assume all bottled water should be similar. But unfortunately, buyer beware. Many of the leading brands of bottled waters have pHs below the 5.5 level at which enamel will start to demineralize. There are many studies readily available showing the pHs of the brand name waters. Propel waters are similar to the pH of most sodas. Dasani water is right on the border of the 5.5 depending on which test you review. Aquafina is closer to a pH of 6. Fiji water is around 7.5. What can you do to reduce the demineralization? The first is to not sip your drink. Many people will spend 20 -30 mins sipping on a drink. This increases the amount of time the acid is on your teeth and causing demineralization. Another recommendation is to swish with plain water after drinking something acidic. Neutral pH is 7. If you can swish with neutral pH water, you will increase the alkaline level of the mouth and can reduce the negative impact of the acid.